Clicking Presses With Turning Arm is one of swing arm clicker press that die cutting the material in sheet or roll forms. 1.It is working with the steel rule die ,forging die etc., any die molds so that can cut out any shapes . 3.The cutting power pressure can be custom built from small ton to big ton .Normal from 5 ton ,6 tons,8 ton ,10 ton ,12 ton ,14,15,16,18,20,22,25,27,28 T etc.,. 4.If you want smal hand press ,Gerson also have right model or you want big large cutting pressure upto 2000ton hydraulic pressure. 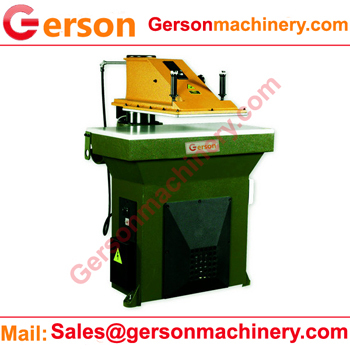 5.Any custom build hydraulic die cutitng press machine ,welceme to contact Gerson machinery.